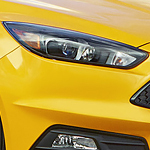 The Ford Focus ST: Comfort and Luxury in a Sporty Hatchback | Donley Ford Lincoln of Mt. Vernon Inc.
How do you feel about comfort and luxury in a sporty compact performance hatchback? Sounds good, right? Then you should take a look at the Ford Focus ST. It has features that will make you and your passengers feel more comfortable, as well as features that will make you feel like putting the pedal to the metal. Heated seats and a heated steering wheel that are made of leather will make you feel warm and toasty yet luxuriously comfortable on cold days. And don't forget how much you'll like the flat-bottom steering wheel, which will also allow you to be sporty while you drive. Even the back seats have leather trim so that your passengers feel included in the luxury. If you're interested in learning more, come take a test drive today. A friendly and knowledgeable sales associates will be happy to have a chat with you while you both take a test drive.